Movie I watched in Hindi — without subtitles! 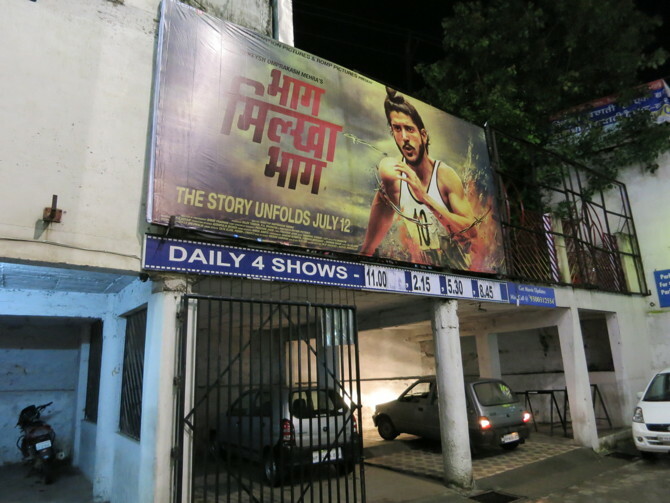 Pradeep and Shibani took me to my first Hindi movie theater to see my first Hindi movie! My challenge was that there would be no subtitles so I would have to see what I could understand from all different parts of the movie – gestures, music, cinematography and expressions. As it turned out, I could understand almost everything. It was interesting. I realized how much I like to focus on words that people say. I see them in my head. Sometimes this might take away from everything else the movie has to give. Not always, I will admit, but sometimes. The movie was Bhag Milka Bhag (Run Milka Run), about the life of world-class Indian sprinter Milka Singh. It’s a pretty incredible story. A childhood broken up by conflict between India and Pakistan meant he grew up fatherless and in a refugee camp. Joining the army, his speed was noticed and he trained and trained and trained (running around the mountains pulling a tire behind him) until he broke the world record. He came in fourth at the Rome Olympics, but, perhaps when it counted most, he was able to put forth a magnificent performance in the India-Pakistan friendship games. That of course is not the whole story, but it’s enough for you to perhaps want to see the movie. It had dance scenes but still packed and emotional and inspirational punch. I also enjoyed how lively the crowd was. They were hollering, cheering and making what I could only guess were inappropriate comments by the laughter I heard in response. Before the movie, Pradeep and Shibani took me to try some street food. Pani purri – hmm, hard to describe. A hollow, thin-shelled fried pastry into which someone pours a sweet liquid and a spicy liquid and you have to eat it really fast. It was pretty exciting. Then for dessert I had kulfi faluda, ice cream of sorts (that came from a can and was chopped up with a knife), topped with sweet noodles and some white coconut-ish type chunky sauce. Both were different than what I’ve ever had before, but very delicious. I came back around midnight. Day 19 had already begun. As you might guess, I woke up pretty late today, and was still brushing my hair when Anu came down to give me breakfast. We had a nice time together and then I started my full morning of writing. There were two notable interruptions I should tell you about. The first is when I spotted a cat on one of my chairs. I had never seen a cat in my place before. I shooed it out the window, which is how I guess it got in. I didn’t think too much more of it, until later. “What happened later?” you’re excited now. Oh, don’t get too excited. I was writing at my desk and I felt hungry so I got up to root around for some crackers. And I look down and saw… a mouse head! The cat had brought me a present. There were other parts of the mouse down there too, but I won’t tell you about them. I cleaned it all up and got down to writing again. Curiously, I wasn’t so hungry anymore. I managed to knock out a draft of my guide. As soon as I’m done polishing, I’ll let you know. I might even test out titles with you. Pradeep and I spent the afternoon going over the guide draft and he finally revealed the solution to the mystery of the swing that swings you. I’ll post a picture and explanation later because it will make a lot more sense that way. It made me happy. It made me even more happy to know that the pieces of the swing are still in his shed! Then, to help him prepare for the last session of the Ethics and Value class, we reviewed and typed up examples of ethical lapses the students had submitted to him. They were stories of their lives, or of things that had happened to friends, cousins and uncles. I was surprised at how many times stories of bribing came up, or changing exam marks. It felt a little clandestine, like I was reading people’s secrets. I am sitting here finishing my post and Shibani’s beautiful music is playing in the background. The last bit of light is still in the sky. It’s beautiful. So are you! “Oh, you!” you say, smiling.